LA CASA DI DANIELA. Salsomaggiore Terme (PR), Italy. You’ll love it | Travel Blog & Co.
You’ll love this place and Daniela herself! The house has been recently restored and restyled, just like it was supposed to be a long time ago… At La Casa di Daniela you’ll feel like at home… or… much better! 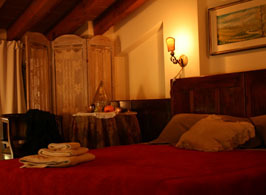 The bedrooms are decorated with a great taste; each room is unique in its style. At breakfast… you’ll desire to have breakfast all your life long! Bread, marmelade, home-made biscuits, cakes, fresh fruit juices, milk, coffee. When we experienced this place our breakfast lasted 2 hours! Just a few minutes driving and you’ll find the very well known Terme of Salsomaggiore, decorated according to Liberty style by Galileo Chini. I suggest to visit this places in the Fall season or Spring. This entry was posted in Hotels & BB and tagged architecture, art, articles, B&B, bed, blog, breakfast, community, culture, emilia romagna, italy, life, lifestyle, nature, parma, people, photography, salsomaggiore, Terme, thermal, travel by costanzafabbri. Bookmark the permalink. Hi there, sorry for late replying… Yes, I receive a lot of spam comments, but my wordpress selects these comments into a specific spam box (like emails).